A Russian vaccine against the Ebola virus has been presented to the World Health Organization (WHO) by Health Minister Veronika Skvortsova. Tests of the drug showed high resistance to the virus five months after vaccination, she said. Russia’s Combi vaccine, which was granted a patent last week, was unveiled at the Palais des Nations at the UN office in Geneva, Switzerland. The volunteers vaccinated with the Russian drug have passed the first and second phase of research and “we can say that after four-and-a-half to five months… they still retained a high titer of antibodies against the… Ebola virus,” Skvortsova said. “In laboratory conditions, this serum allows to completely neutralize the wild virus Ebola, with almost 100 percent efficacy," she added. Skvortsova noted the Russian vaccine against Ebola may be used in Guinea as early as March or April, with plans to produce up to 10,000 dosages of the drug every month. She has also scheduled to meet WHO Director General Margaret Chan on Tuesday. Russian scientists required “a rather small time frame” of 15 months to develop two-vector vaccines against Ebola, which use a chemically weakened virus to transport pieces of the pathogen in order to stimulate an immune response, Sergey Kraevoy, deputy health minister, explained to TASS in January. “The first vaccine includes an RNA and DNA-containing virus, triggering immunization in accordance with the so-called booster mechanism when one vector enhances the effect of the other, which leads to a significant stimulation of humoral and cellular immunity," he explained. The second vaccine is designed for people with immunodeficiency and consists of a single vector of the DNA-containing virus with built-in Ebola genetic material. The drug “has a greater effect on the cellular link, increasing activity of cellular immunity more than 30 times," Kraevoy said. 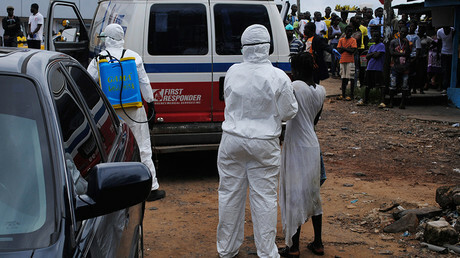 The most recent Ebola outbreak began in Guinea in December 2013, before quickly spreading to Liberia and Sierra Leone and ultimately claiming 11,000 lives. The World Health Organization declared the end of Ebola transmission in November 2015, beginning a 90-day period of enhanced surveillance. However, both UN Secretary General Ban Ki-moon and the WHO have warned that despite all known chains of the transmission of the virus being blocked in West Africa, new outbreaks are likely to occur in 2016.